Sprinkled throughout the Science Service records are traces of a merry crew, the fading shadows of colleagues who shared jokes in the workplace, made up fake press releases to announce marriages, created gag photographs to make each other laugh, and sprinkled their speeches and correspondence with humor. Astronomer James Stokley normally adopted a dignified demeanor while working on the Science Service staff. During the 1920s, however, for undisclosed reasons, he posed in pince-nez and bowtie, with a mischievous glint in his eye. Family members joined in the fun. 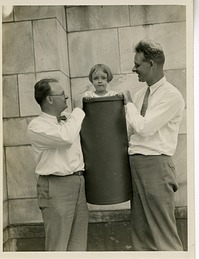 During the early 1930s, Watson Davis and Frank Thone posed for a series of gag photos with Watson's daughter Charlotte. Thone then took the gag one step (or one wastebasket) further. Frank Thone had a Ph.D. in biology from the University of Chicago and wrote the organization's "Nature Ramblings" column. Such interests may have inspired the "facial insect ramble" photograph created by Science Service staff photographer Fremont Davis. By the 1930s, Watson Davis had become a popular speaker, making the case for popularization and offering insight to the state of science in the United States. Davis kept a file of jokes, anecdotes, and aphorisms to insert into speeches, many of which are archived in Record Unit 7091: Science Service, Records, circa 1910-1963, Box 443, Folder 10. On one of the cards, dated November 5, 1938, Davis recorded how his young son Miles had reacted to the Smithsonian Institution: "Miles visiting U.S. Nat. Museum Industries Bldg. liked it so much he said: 'If I can find a hook sticking out around here, I’d like to shake hands with it.'"